About Bats: Bats often form large maternity colonies inside attics of homes and buildings. They can roost in huge numbers, and create odor problems and health risks with their droppings. We are experts at bat control and removal from private homes and properties. We excel at both Arlington bat trapping and prevention. We are not a bat exterminator company, but we use techniques such as humane live trapping, prevention, and exclusion to solve your Arlington / Fort Worth bat problem permanently. We boast a 98% success rate, the highest in the industry, and are voted the Arlington / Fort Worth area's top wildlife animal control company. Give us a call at 817-717-3606 and we will take care of your bat issue for good. About Us: All Animal Control in Arlington and Fort Worth TX is a full-service, licensed and insured nuisance wildlife control company. We solve conflicts between people and Texas' wildlife. We are considered the best wildlife control company in the Dallas area, and our rates are not only competitive, but well below the average for the area. We are a small, owner-operated company, and we don't have the overhead of the big companies. Also, unlike the larger companies, we do our own work (not some underpaid and careless employee) and we take great pride in our work. Give us a call to discuss your Arlington bat removal project, and we will give you a price quote on the phone, and schedule a same-day or next day appointment at your convenience. 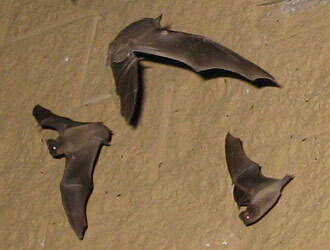 Bats end up residing in one’s house due to many reasons. May be one has left his door open for them to enter or a window of the house was open or 90% of the chances are that they end up entering from the small gaps in the building structure. They reside in areas such as chimneys, vents, attics or wall etc. After sometime they might end up crawling into the living area of the house. The reason of it crawling there might be it feeling trapped inside the house and wants to leave the place. So it keeps on flying fast in circles and then rest for a while and repeats the action. One can leave a window open so that bat can leave through that one when it realizes that it is open. The same thing can be done with the door. Secondly other option could be one capturing the bat with a butterfly net and releasing it outside the house. Same thing can be applied with the jar. Capture it in it and then release it outside the house. Blanked can also be used for this purpose that is capturing and releasing it. Now this is a solution when bats end up entering the house. One should take prevention tips in the first place for not letting it enter the house. Now the question is how one can keep the bats away from the house when they are commonly found in the neighborhood. One starts with checking the whole structure of the building for any gaps as small as 3/8 inch. Before bats can easily squeeze into this gap and ends up residing in that area. So through inspection of the structure is the first step to eliminate the threat of bats residing in the house. Once you have checked all the places especially the roof and its bricks chimney or the attic for that matter start filling the gaps with the simple caulk. One can also use hardening foam for filling the gaps in the structure. Because both of the materials are good for the job, that is sealing the gaps properly so that no bats end up residing in the house through these gaps. Netting the areas also helps in preventing the bats to enter the place. One can only prevent bats from the pool is by installing a screened in enclosure. The screen around the pool will help in preventing the bats to enter the pool. Otherwise there is no other solution for this Arlington TX bat control problem. If one sees a flying bat near the porch one should straight away check for bat colony in the porch or they should completely survey the building for bats colony. The colony might be residing in the walls or in the attic of the building. Bats are not a favored by majority of the people so they despise the idea of them being around in their houses. So if one finds the colony in the house trap it with the help of a professional and remove it from there. There are two types of repellents to prevents bats from entering ones house, commercial and natural repellents. The commercial repellents are available in the main store of the residing areas. But problem with these repellents is that they might not work all the time so a bat might leave the place for a while and then come back again to reside there. Naphthalene is also used as a repellent for bats and surveys on it has shown better results as compared to others commercially available repellents. One has to use a specific amount of this in order to make the bats stay away from the house the hindrance with this would be that the amount also becomes dangerous for human too. Since its smell is strong and that causing the bats to stay away when a person enters that close space where it is being used he or she ends up getting exposed to it so the individual needs to be cautious about this problem while using this technique to keep the bats away. If one places a bright light at the entry points of the bats they work as repellents for them and thus keep them away from residing in that area may it be the attic or the house. The problem with this is it ends up attracting other insects such as mosquitoes. One should keep this is mind while going for this kind of measures to keep the bats away from the building. There are no natural repellents for Fort Worth bat control that can keep the bats away from your structure so one needs to rely on the commercial ones available at hand.